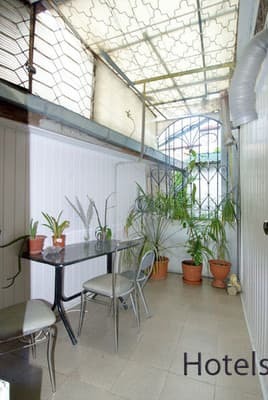 The apartment is located in a residential area near the vegetable market. Not far away there is the Bystraya river. To the equipped beach - 15 minutes walk, to the Embankment - 10 minutes. The apartment has two bedrooms with double beds, cable TV, air conditioning, two wardrobes, a kitchen-living room with two unfolding sofas, an aquarium with ornamental fish, a TV, a kitchen equipped with the necessary equipment. Cold / hot water around the clock. The bathroom is spacious, made of Italian tiles, imported furniture with a huge mirror, acrylic bathtub, built-in washing machine. There is a furnished balcony. Parking by the house. The apartment can accommodate 6 people. Nearby are various shops, a circus. Distance to the bus station in Yalta - 1 km, to Simferopol is 80.1 km away. PRICES MAY CHANGE, IT IS REQUIRED TO RECEIVE INFORMATION FROM THE OPERATOR. 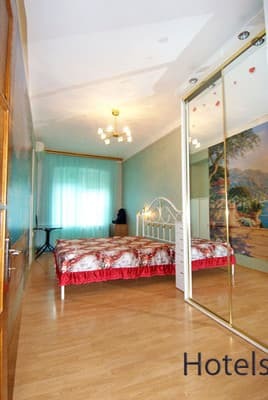 Description of the room: In the apartments there are two separate bedrooms with double beds, air conditioning, cable TV, two wardrobes, a kitchen-living room with two folding sofas, an aquarium with ornamental fish, cable TV, the kitchen is equipped with necessary equipment. In the kitchen - stretch ceilings, extractor hood, gas stove, oven, microwave oven, electric kettle, refrigerator, dishes. The bathroom is spacious, made of Italian tiles, imported furniture with a huge mirror, acrylic bathtub, built-in washing machine. The apartment can accommodate 6 people. Children under 3 years stay free of charge. The cost of additional seats depends on the season (specify when booking). 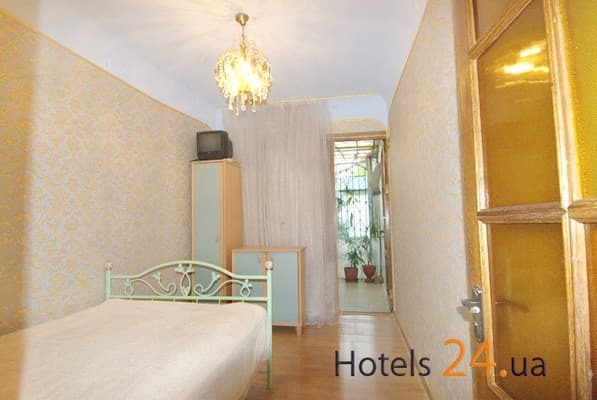 The apartment is located in a residential area near the vegetable market. Not far away there is the Bystraya river. To the equipped beach - 15 minutes walk, to the Embankment - 10 minutes. Nearby are various shops, a circus. Distance to the bus station in Yalta - 1 km, to Simferopol - 80.1 km.